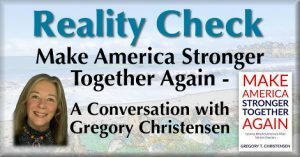 This week on Reality Check, host Lee Tuley talks with homegrown author and political animal, Gregory Christensen. He’s just finished a new book called Make America Stronger Together Again. Listen in to get the inside story of his experiences in the Clinton campaign, his take on the current situation in Washington, and what the future may hold. That’s this week on Reality Check on KCIW.